You are currently browsing the The Pet Product Guru blog archives for the day Monday, March 19th, 2018. Is Poop On the Menu For Your Dog? We’ve all seen in and most of us are disgusted by it. 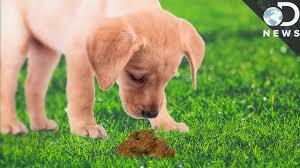 Your dog eating poop that is, whether it be cat poop, their own poop or any poop, it’s disgusting! Why do they do this especially after they are fed a healthy diet? Rather than why they eat it, how can we stop it? Pet Helpful has put together things you can do to stop this bad habit. Feed our dog a healthy and balanced diet. This will keep a dog’s digestive system healthy and provide him with all the nutrients that his body needs. An easy way to provide our dog with a balanced diet is through high-quality kibble. Make sure the kibble has good protein sources that are from meat, rather than from grains, which are more difficult for our dogs to digest. Stay away from kibble that contains gluten (e.g. wheat gluten). Compared to meat protein, gluten is less nutritionally complete and may contain contaminants. Keep a consistent feeding schedule and supervise their poop time. A consistent eating schedule will also keep a dog’s stool regular. This makes it easier to supervise, and prevent our dog from eating his own poop. Scheduled feedings will also help to prevent overeating and obesity issues down the road. Exercise your dog and keep him busy. Play fun games with your dog, walk him regularly and do frequent obedience training sessions. A well-exercised dog is better-behaved at home, and less likely to eat poop out of boredom. Keep the environment clean. If there is no free poop lying about then our dog cannot engage in opportunistic stool eating. Reduce stress. Try to reduce our own stress and keep our dog relaxed. When we are calm, our dog will have an easier time staying calm as well. This results in a better quality of life for everyone and will stop stool eating behavior that results from stress. Teach your dog the “Leave-It” command. “Leave it!” helps us communicate to our dog what is acceptable to eat, and what is not. Poop is unacceptable to eat, as are some common houseplants such as oleander, and some common people food, such as onions and chocolates, which are poisonous to our dogs. Good luck and thank you to Pet Helpful for providing this valuable information! add comment Comments Off on Is Poop On the Menu For Your Dog?